I've been meaning to write this review so long now but something always got in my way. 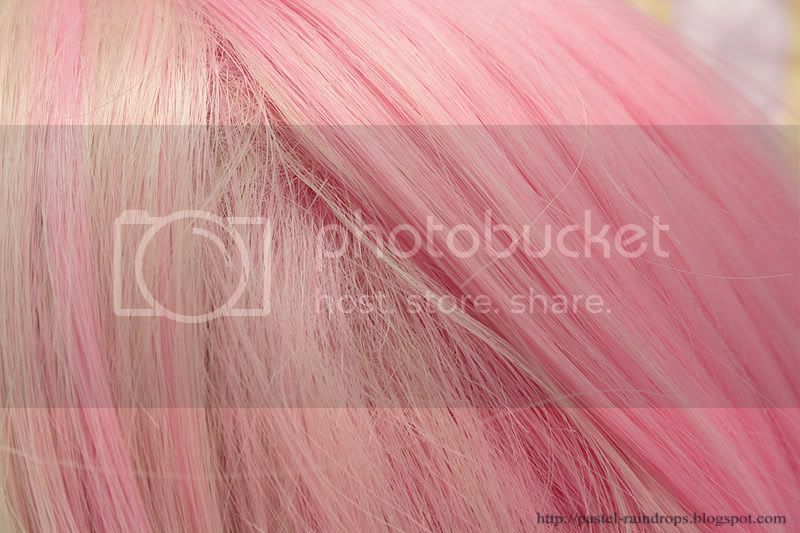 When I first saw their pink-blonde split-wig, I figured that this was possibly a great opportunity to have cute and colourful hair without having to damage my own any longer. Since many of you probably know, I used to have that kind of hairstyle quite often in the past but since last summer I'm trying really hard to grow out my hair the healthy way. After thinking it over some more I decided to take part in their pre-order in late November '10. Shopping at the MintyMix page is pretty easy, the only thing that bugged me a little was, that I didn't get a confirmation mail, just to know everything was alright with my order. I got another mail from Kammie (the owner of MintyMix) saying that there was a delay in sending out the pre-ordered wig due to the fibre company. To compensate this, she offered a 10$ or a total refund in case anybody didn't want it anymore. But since I didn't need to get it in time for anything I was perfectly fine with working and that little discount was all fine for me. 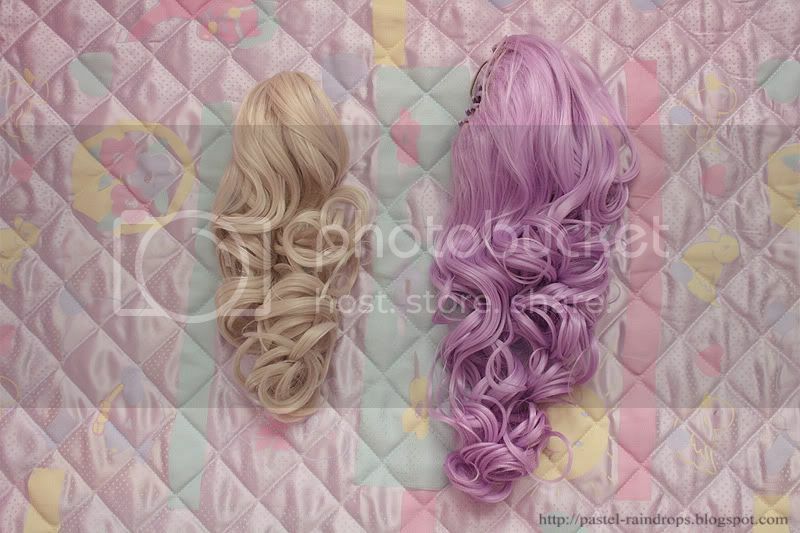 At that time I also asked her if it was okay to add another wig in to the total, since they just updated with more colours, because the one I've purchased already wouldn't be shipped out that soon anyway. But all that was no problem so far. Adding a second wig isn't a problem, Kammie mails, she'll send me an invoice for it. On the 21st December '10 she wrote me another mail, asking me if she already invoiced me. I answered 'no' of course and was hoping to receive one very soon. It's the 22nd December '10 now, when she sends out a mass mail to everybody who participated in that pre-order, saying that all wigs are ready to ship. She also mails me, saying that she'll check the shipping first to get a total, which she'd invoice with me later. Again, all fine with me. I was very happy that things have sorted out and my wigs would be send out soon. Christmas is over and still no invoice or answer from Kammie, so I mail her if everything was alright and if she's send me the invoice soon. But no answer from Kammie. New Years has passed and no invoice or answer from Kammie. I hate to be pushy but I wanted to get this solved out, so I mailed her again. Meanwhile: a few days passed by and no invoice or answer from Kammie. Two weeks passed since I've last got a mail from her and I got a little worried as well as impatient since I kept mailing her without getting a single reaction. Then, I think it must've been the 5th January, a friend of mine who also happened to knew Kammie gets involved and mails her as well. I was very thankful for this helping hand, hoping it would help. Finally, a mail from Kammie! And an invoice as well! Oh my, I was really relieved after receiving it. So, Kammie apologized and said she didn't answer me due to things being busy in the holiday season. I then paid directly and on the 8th January she mailed me that my wigs finally were shipped out. WHAT. A. RELIEF. Now, I have full sympathy and am very understanding if people get busy, especially during holidays, but I would've wished for a little bit more communication. Sometimes in between all this I was almost about to lose my patience but I didn't want to be unfair. Still, I think there would've been so many days in between holidays and after to at least answer my mails. I really didn't expect my wigs to be sent out within seconds or anything crazy like that, but a simple mail to tell me what was going on would've been more than nice. Because I think customer service and most of all communication is the most important thing when running a business like that. Well, maybe it was just another experience Kammie and also I had to make and I hope things are better with her shop now. After telling you about the long journey of purchasing the wig, let's talk about the wigs themselves. Sadly, the first thing that was greeting me when I unwrapped them, were some little strands of lose fibres, not so cool. 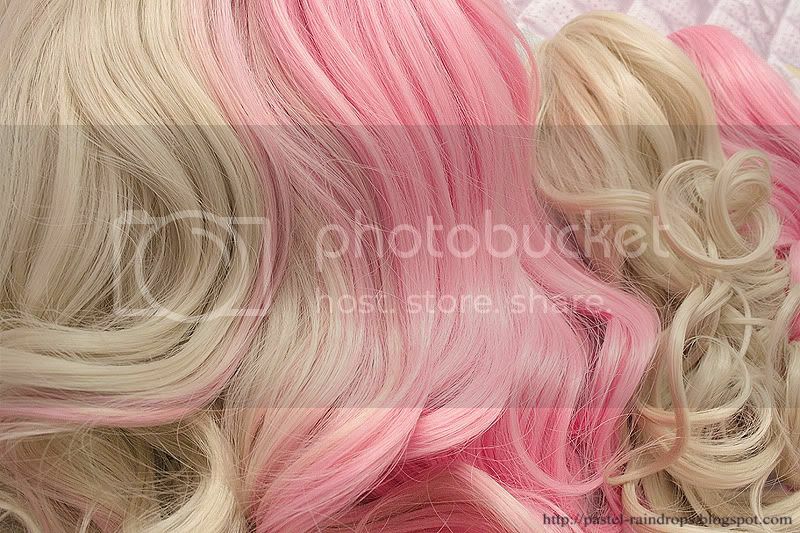 However, I must say, both wigs are very true to the stock-pictures in color and structure. After running through the wig with my fingers, detangling the curls. The fibres are very, VERY, soft to touch and feel incredibly nice! The wig itself is very full and also a little puffy because it's a little teased on the inner layer. The clip-in falls are a little thin in comparison, though. A little close-up of the fibres. They look really natural I think and have a nice, not costume-ish or cheap, healthy shine to them. 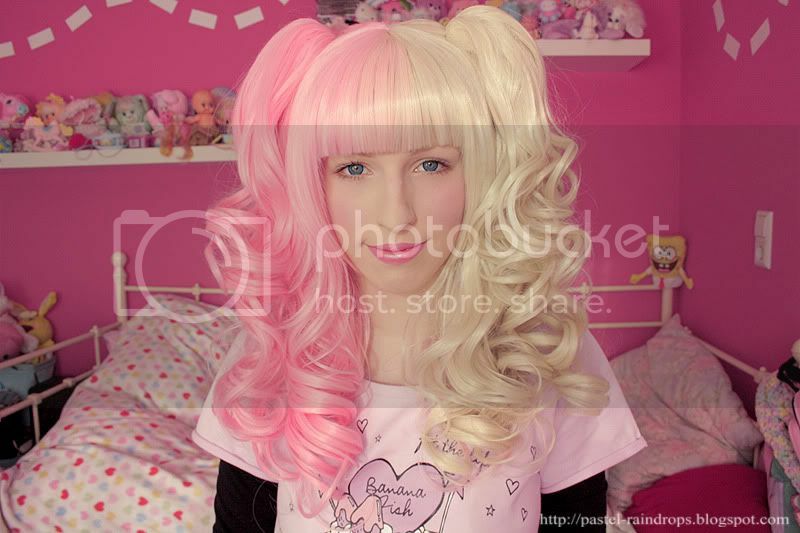 Me wearing the wig ♥ I actually had another picture I took with flash-light but the result was pretty much the same due to the lightening in my room being rather bright that day. Of course I also cut the bangs first! Also after I've run through with my fingers. 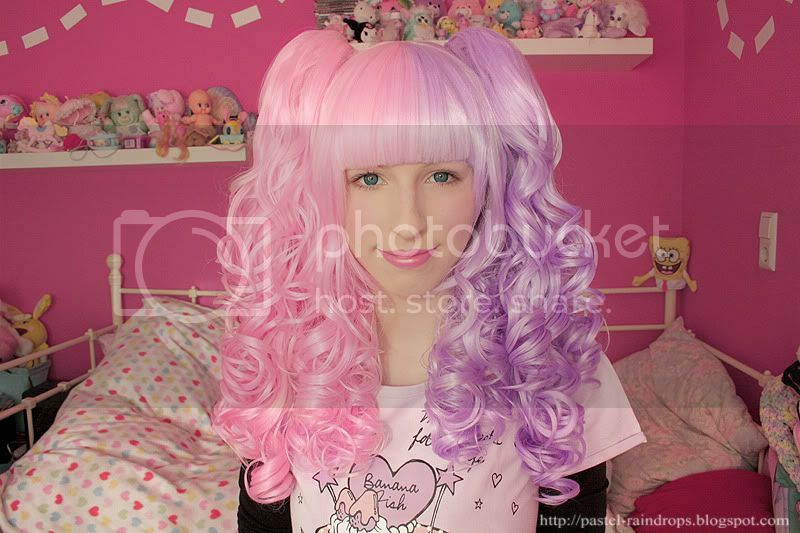 The lavender-pink wig is a lot curlier than the pink-blonde but looks just as adorable. Feels incredibly soft and natural as well, just as the other one did. 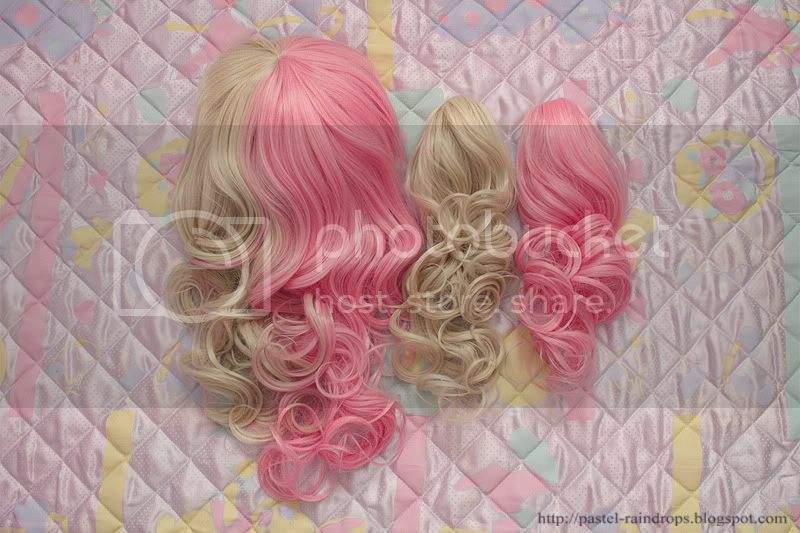 The wig, though, is almost thin in comparison to the pink-blonde one, while the clip-in falls are very big and full. It's the complete opposite. But I really wished the wig was at least a little fuller because I'm a little afraid of the netting being visible when it's worn outside in windy weather. Just like the other wig it fits my head perfectly, and if it wouldn't it still was adjustable. The bangs are cut in these pictures as well (even if they're a little crooked, I must admit). Definitely two different style but both are equally adorable. 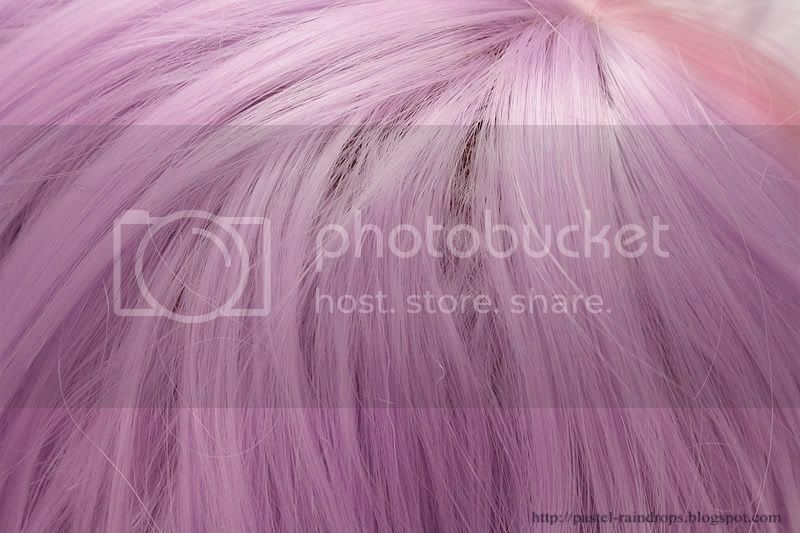 But you can also tell that, despite all those curls, the lavender-pink one is slightly less full than the other. I tried to capture what I meant when saying that this wig felt a little thin. I really only pushed some fibers in a different direction and voilà, the netting showed. On this wig, however, you can only see how there's a little teasing going on, which adds some fluffiness, but no netting that shows through. Even though I had a somewhat unfortunate start in terms of communicating with MintyMix/Kammie I'd probably buy from her again because I believe that she also gained experience from this situation and I also think she's a kind person who's always trying their best in cases like this. Even though I hadn't had another opportunity to deal with her again, I believe she changed her customer service to the better. 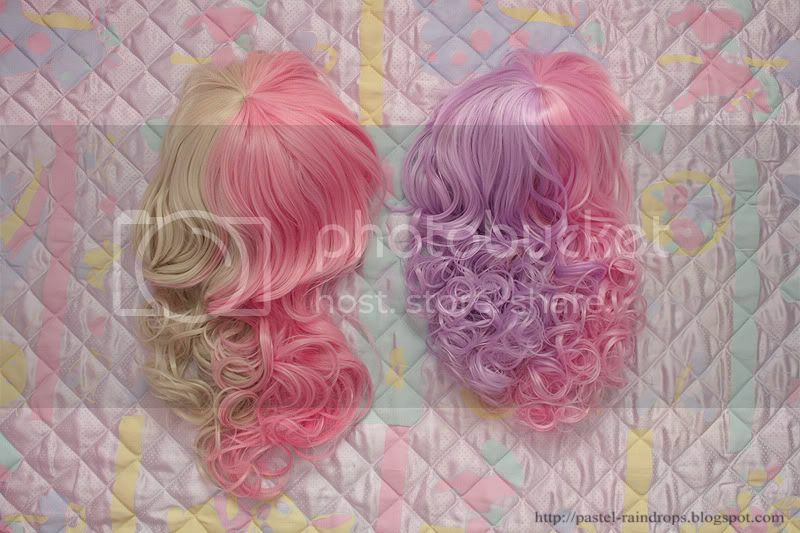 Also, despite some minor negative points I really, really like the quality of MintyMix wigs. I know many people don't like split-wig at all, in general or because they only had an overdose from them in the past few months, but I really do like them. Say whatever you please but I love unnatural colored hair, funky hairstyles and also 'costume-ish' looks, like some would call it. Thus, I think they make a perfect match to the colorful part of my wardrobe. 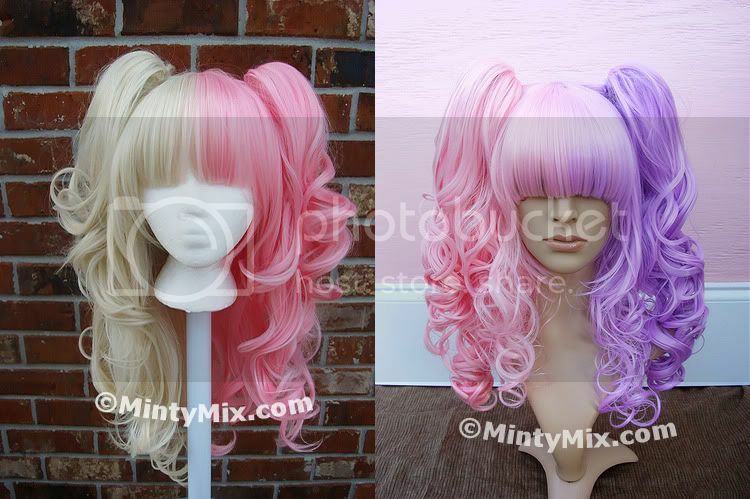 I ordered a wig from mintymix afew weeks ago, just waiting for it to arrive, even more excited now. Wow, they are really gorgeous! 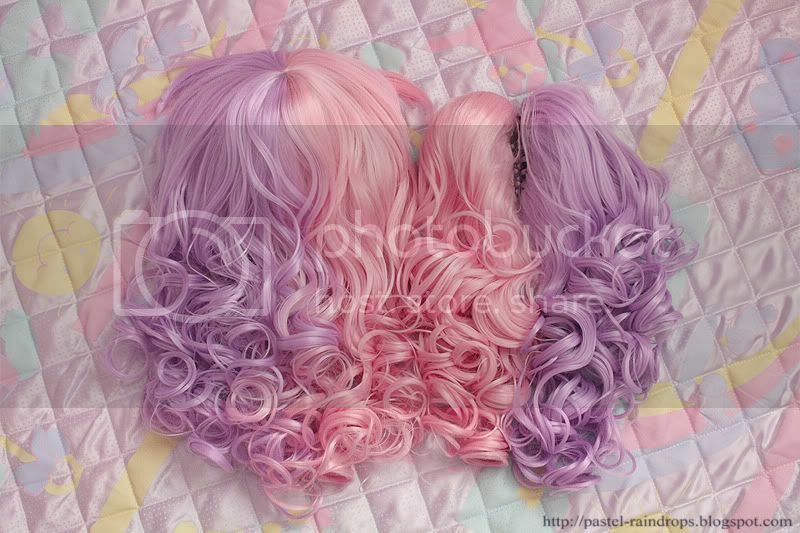 *A* I have been considering buying a wig or two just for fun lately.. I might have to get one of these! By the way, I'd like to say thank you because you are posting often in these weeks! I think her shop is basically a one person operation, so it probably is quite hard to keep up with orders and such, especially over the busy christmas period when lots of people will be ordering things and there's lots of other personal things going on. I think Kammie has done really well with her shop! 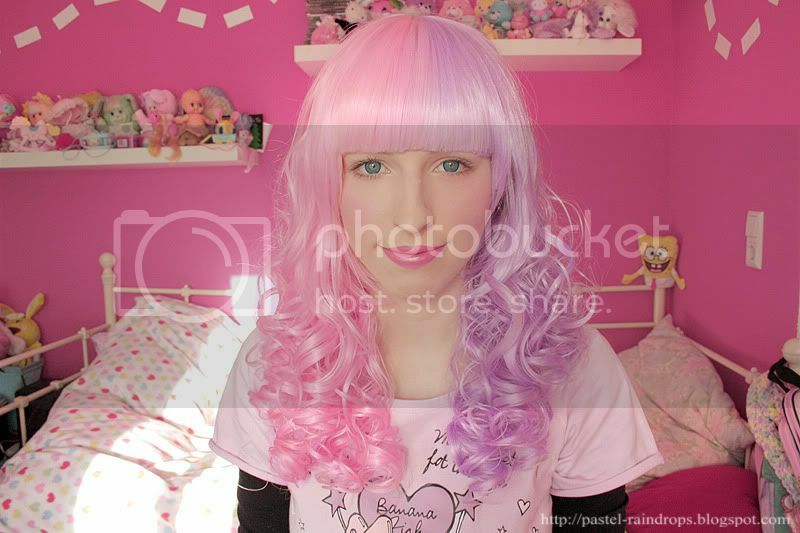 The wigs on the mannequin heads in photos look so similar so I'm glad when you got them, you did comparison shots because it's very clear what the difference is! I don't have that much experience in keeping wigs nice but I try to storage them away from dust, safely packed away in a non-static bag. Also, if they happen to tangle up I brush them carefully (starting from the ends of the fibres in the bottom and working my way up to the top) with a wide-toothed brush or comb. If it's really messy I start using my fingers first, though to detangle it roughly. And if the wig is in a very bad condition I wash it with something like baby shampoo and condition it (there's also special wig shampoo conditioner, I think) but don't rub it in! Just let it soak a little in the cold water and then rinse it. And while doing so it's most of the time a lot easier to detangle a wig but be careful with it and don't pull the fibres too hard. I know that and I try my best in understanding it but I still feel that it should be possible to at least send out one little message so costumers know that they're not lost or forgotten. I think that kind of communication is the most important thing when running a business like that and if this is too much for her then she should maybe ask for somebody to help her. It's tough to handle such things all alone and it obviously is too much for her, at least it was during the holidays. i have a little question that is pretty offtopic, but i'd really like to know.. what make up do you use? because your skin always looks so perfect and clean! I'm using a TV coverstick by Kryolan but it's actually a theatrical make-up but very opaque. I use it as foundation and to cover up blemishes and shadows. Over that I'm using a Perfect Tein 2 in 1 powder by Manhattan. 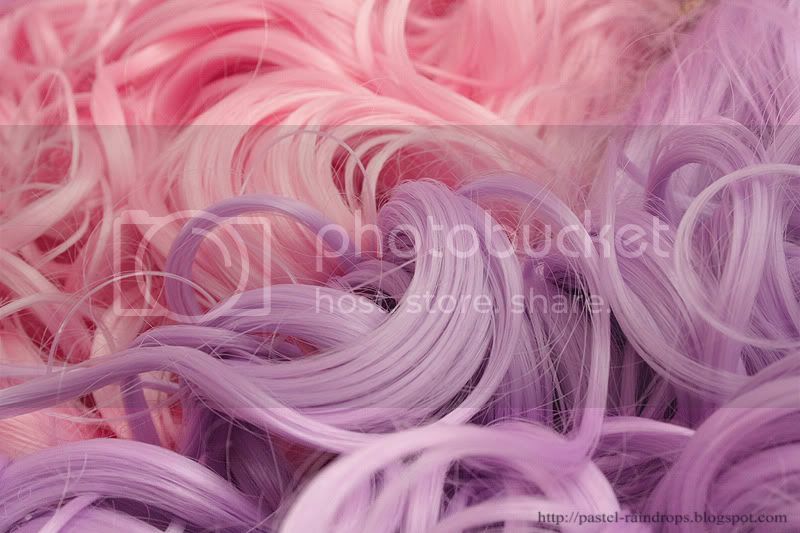 The second wig is quite a little bit unrealistic.. with it's colors.. .__. Well, as I said in this post there were a few problems about that but I'd still buy from MintyMix again. Die sehen so toll aus! Schade, dass die meisten interessanten Perrücken z.Z. "out of Stock" sind, weil die für Perrücken eigentlich unverschämt günstig sind. Vorallem die Pink-Blonde Perrücke gefällt mir sehr gut!